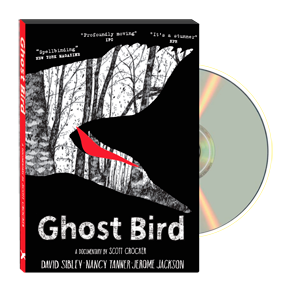 The DVD includes “A CLOSER LOOK", nine bonus scenes with over forty minutes of new Ivory-bill insights and unexpected revelations. • MARY SCOTT: The Prehistory. • TIM BARKSDALE: Eye Witness. • CATFISH DUDE: Arkansas Outsider. 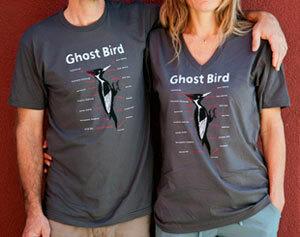 The Mark Dion Ghost Bird ArT-Shirt! like "Elvis Sighting", "Cryptozoology" and "Faith-based Ornithology". Tees and V-necks available in ambiguous gray. Made in the U.S.A. by American Apparel.